Kristin Mahoney (pictured middle), PWW’s Office Manager in Vermont, had only been working for Pure Water for the World for three months when Carolyn Meub, Executive Director, decided it was time for Kristin to visit Haiti. She knew that for Kristin to gain the best understanding about the mission of PWW, she had to experience it for herself. 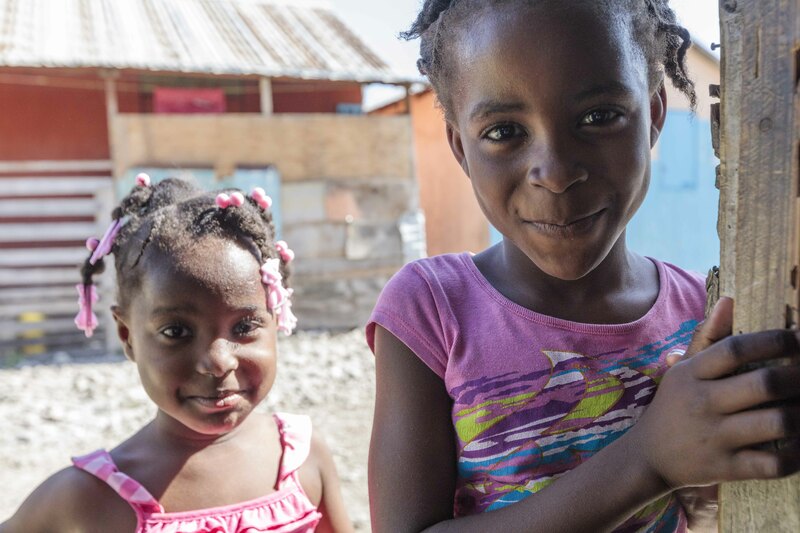 Kristin found herself on a flight to Haiti with anticipation dancing in her brain. Until now, she had only experienced Haiti through stories and photographs. Now, it was coming to life, and it was beyond anything she could have imagined. It didn’t take long for Kristin to be swept up in the action in Haiti. The first day included a scheduled visit to Cité Soleil. 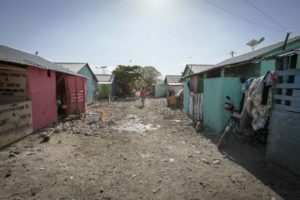 While the island of Haiti resembles a tropical paradise, poverty and lack of government services has left millions living well under the poverty line. But, Haitians have learned to dig in, endure, and persevere…even in the hardest of times and in the most unimaginable of circumstances. Cité Soleil is the Western Hemisphere’s largest slum. It is here that a Community Agent introduces Kristin to a local woman living without the means for safe water. Litane Duvert lives in a small cement structure with nine children, ranging from three to seventeen years old. The home is cramped as everyone gathers inside. The one window and dirt floor do little to combat the tropical heat and humidity. Litane is happy to host her guests and busies herself by gathering chairs, which is all that she has to offer in her well cared for and spotless living space. It is her first visit from PWW. Through translation, Kristin is introduced to Litane’s daily struggles of obtaining water. As is the case for so many in Haiti, Litane’s home does not have running water or electricity. 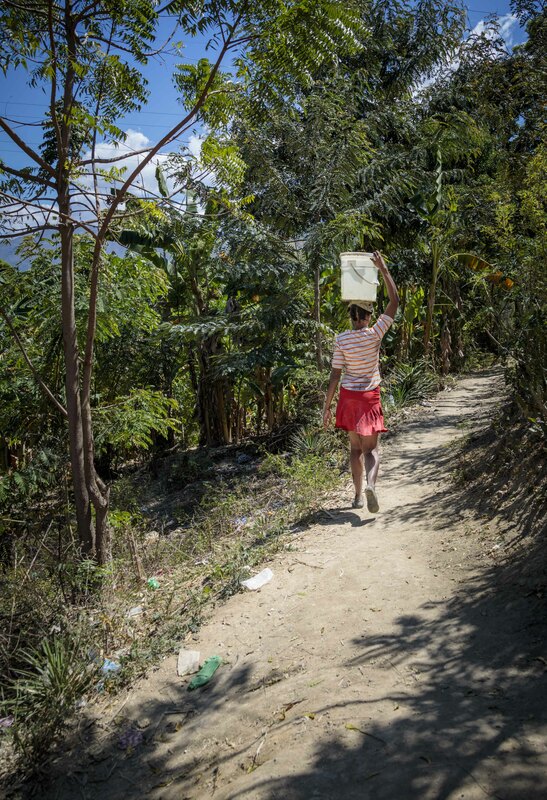 To provide her family with drinking water, Litane tells Kristin that she must walk. Barefoot, she often walks for hours, collecting as much water as she can carry. Sometimes the water source is dried up, and her only hope is that there will be water tomorrow. When she does reach the water source (which is not potable), it is not limited to drinking needs. Often, she is met with people bathing and washing clothing. Once home, Litane improves the water with the little chlorine tablets she has purchased, yet it is not enough to support the water needs of her large family. She selflessly gives her children the treated water, while she consumes the remaining contaminated water herself. Even with the chlorine working to help make the water potable, the family suffers from persistent diarrhea and Litane endures the biggest tole; her stomach is distended to show the evidence. She is weak from her ailments and constant treks for water. Despite all of this, Litane perseveres because that is the only way she knows how to provide for her family. Now, PWW is making it possible for her life to change. She will soon have her very own clean water filter. After paying a modest fee for the filter (encouraging personal ownership and commitment), Litane will take part in a one-day filter and hygiene education course, led by the PWW team. The course will teach her how to take care of her filter and she will learn about the essential safe hygiene practices that will help keep Litane and her children protected from waterborne illnesses. She will then receive her filter. While PWW will do routine checks to make sure the filter is working properly and is kept clean, Kristin feels certain that, like everything else in the home, it will be well taken care of. Litane agrees to the terms with a beaming smile. She is thankful and proud to be able to offer her family a promising future. Litane’s story is not uncommon in Haiti, and beyond, as millions of people struggle on a daily basis to access clean water. While Litane’s family is just one of the many, Kristin is honored to know PWW made a difference for them. Kristin describes the ripple effect that PWW has on a community. In addition to families consistently using the filters, they often share their filtered water with neighbors who do not yet have a filter. And, the fundamental, critical hygiene practices they learn stays with them throughout their own lives and is passed down to future generations. Kristin’s trip continues as planned. Each day is a new project, from filter installations to testing local water sources, but Litane’s story remains in the forefront of Kristin’s mind. She thinks of her gracious smile and her courage through hardship. What strikes Kristin most, during her time there, is the resilient Haitian spirit that she sees time and time again, in each family with whom she interacts. She sees that the people want to help themselves and their communities. They just don’t have the means to do it. “It’s difficult to understand how big the problem is. I had no idea of the scope of it until I got there,” Kristin passionately expresses. 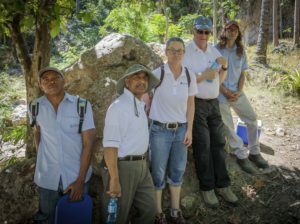 While the problem persists, Kristin’s drive to help create change is reaffirmed with one visit to Haiti. Her work for Pure Water for the World isn’t just supporting clean water for people. It is creating healthier futures for families, lending a hand when a community feels forgotten, and reflecting the best of human nature…compassion. Thursday, March 22 is World Water Day. YOU can make a difference for a family like Litane’s. Learn more.